Yes, it's delicious, and rice cookers are an appliance bestowed upon the home cook by the food gods. But it's far too easy to end up with grains that are globby, mushy and sticky (not in a good way). The fine folks over at America's Test Kitchen have some wizardry for wannabe rice masters, and it's all about the ratios. Conventional rice packaging lists different amounts of water based on the type of rice being cooked: 1 cup of rice to 1 cup of water for short grain white rice; 1.5 cups of water for long grain or medium grain white rice; and a massive 2 cups of liquid per cup of brown rice. ATK tested 17 different types of rice under controlled circumstances -- they put each variety in a sealed bag with one cup of water -- and found that every single type cooked perfectly with a 1-to-1 ratio of rice to liquid. So what's the deal with the packaging instructions? It actually comes down to the vessel used to cook the starch. Different pots with different lids under different heats can cause the water in the pot to evaporate at varying speeds. 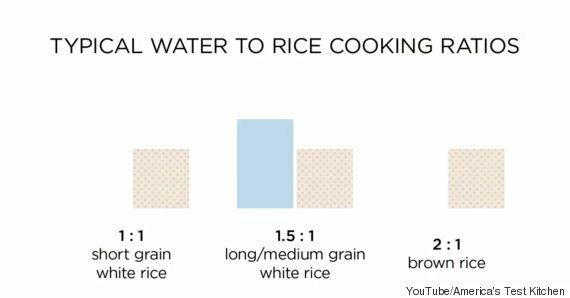 The rice only needs to absorb one cup of water, but the additional liquid is boiled off, which is why longer-cooking types like brown need more water. If you use too much water, the grains can become mushy, and too little water can re-harden the rice, causing it to stick to the bottom of the pan. But there's a catch to the perfect 1-to-1 ratio: You need to test out your own ratio based on your heat source and intensity, as well as vessel size and shape. The test kitchen used 2.25 cups of water for 1.5 cups of white rice pilaf in a large saucepan with a tight lid to get the perfect fluffy rice. 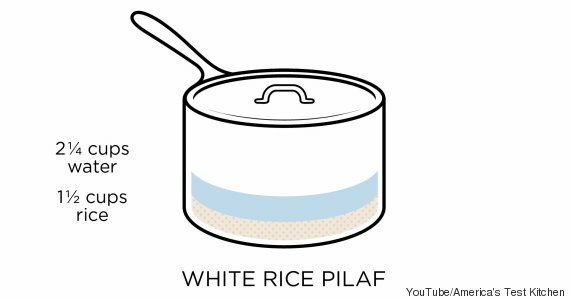 Based on your own schematics, make a few batches until you find the right rice-to-water ratio, and then use the same pot, lid and heat source each time. If you want to double or triple the batch, however, you can't do the same to the ratios. The same amount of water will boil off each time, so subtract the amount of rice from the amount of water in your original perfect batch. This will give you the amount of water evaporated off. Then you add this amount (three-quarters of a cup on the example above) to the 1-to-1 ratio. Phew. Take a look at the video above for a full explainer, then get to cooking.